Filipinas deserve the best when it comes to their beauty. Well, Filipinas everywhere will now be empowered to showcase their looks and their character with L'Oreal Professionnel. L’Oreal Professionnel’s advocacy is to provide all Filipinas with the best hair color using the right hair color brand for them chosen through proper consultation and diagnosis. They also aim to teach hairstylists about the science of proper skin tone diagnosis in order to give every Filipina - mestiza, morena or chinita- the hair color that suits her best. This is where the Wear Your Color Proud Campaign comes in: to bring back proper consultation and diagnosis in the salon. An integral part of this campaign is the Color Consultation Diagnosis Guide and Training to aid both the hairstylists and their clients based on the latter’s skin tone and a clear understanding of L’Oreal Professionnel’s color brands for the clients’ preference. With a reliable education tool and guided consultation and diagnosis with the hairstylist, you will now be able to choose the proper hair color that will suit you best, giving you more control over your hair color overall. This collaborative effort will also make you more comfortable over your decision, and give you a boost of confidence and satisfaction. For this campaign, L’Oreal Professionnel has partnered with the Professional Models Association of the Philippines (PMAP). With a healthy mix of different kinds of Filipinas in its roster of talents, PMAP is the perfect partner to represent the campaign. To be able to execute this grand partnership in a sensational manner it truly deserves, L’Oreal Professionnel mounted a beauty and fashion shoot with non-other thanPhotographer Sara Black and Fashion Designer and Project Runway Philippines alumna Milka Quin. 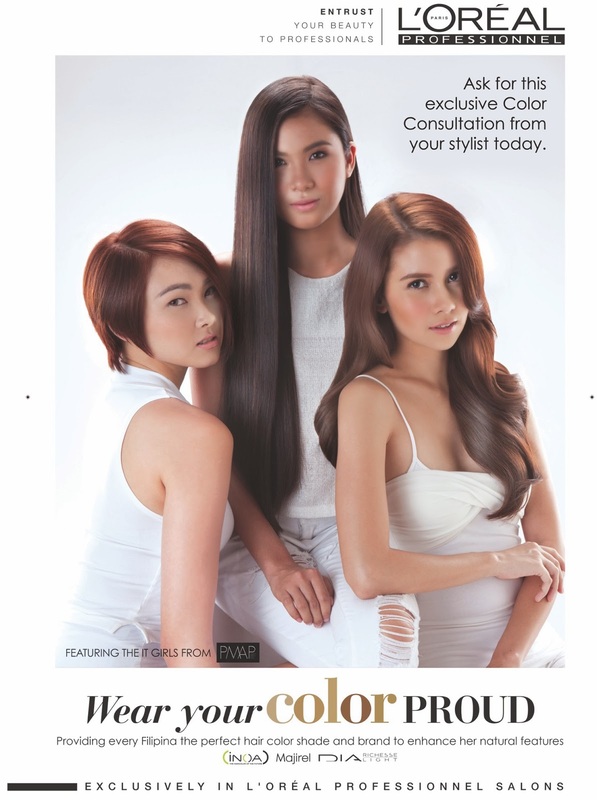 Together, the team was able to elegantly express the message the campaign aims to convey – that every Filipina - mestiza, morena or chinita - can now be be prouder by having the most ideal hair color for her. Now, it is your chance to get the hair color that will suit your skin tone best! L’Oreal Professionnel is holding the Wear Your Color Proud Week where women are invited to get the hair color that will truly bring out the best in them and will make them prouder.This November 11 to 15, we are offering a special promotion: For every hair color service that one person will avail, get another hair color service for a friend absolutely FREE! This will be available in the partner salons of L’Oreal Professionnel: Bench Fix Salon; Bang’s Tony & Jackey; Henri Calayag Salon; Philippe Tordjman Le Salon; and Regine’s Salon. The winner, Em Maglasang, will be contacted. Congrats!